Kroger’s Atlanta Division and local brand personality, Aundrea Dumas, have joined forces to launch “Cutie Cakes – Cupcakes in a Bottle.” The new product is offered at 29 Kroger stores in metro Atlanta and Savannah, Ga.
Cutie Cakes were developed by Dumas as a simple and convenient alternative to preparing cupcakes and cakes without the fuss. Each bottle of Cutie Cakes is pre-mixed and can be easily poured to make 12 cupcakes or one single-layer cake. Cutie Cakes are available in chocolate, red velvet and key lime. Cutie Cakes are exclusive to select Kroger stores, and represent the grocer’s commitment to supporting locally sourced products, as well as its Supplier Diversity Program. Dumas is a native of Savannah – and Cutie Cakes are one of the many offerings of her integrated food, media, merchandise and publication company. 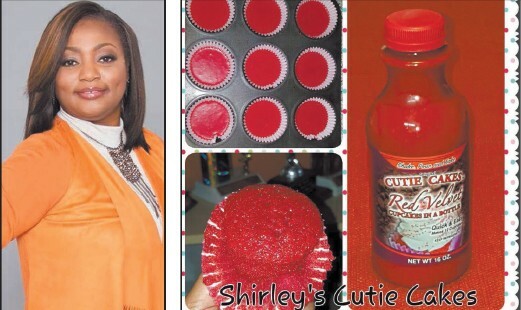 Her “ShrabCakes” have been sold in more than 200 Kroger stores since 2005. Additionally, Dumas has published several books and is the former owner of Shirley Cutie Cakes Bakery in Conyers, Ga. The Kroger Supplier Diversity Program is designed to foster the promotion, growth and development of minority, women and other diverse owned enterprises. Learn more about Cutie Cakes at www.Cutie- Cakes.net.